Late autumn weather in Portland can make any outing on a cloudy day a gamble; the region has a rainy reputation with good reason, and weather reports can be unreliable guidance. This past weekend, I decided to roll the dice and headed out before sunrise to visit some of the wetlands on the north side of the city. I had expected a bank of fog, which would have killed most chances for photography, but was pleasantly surprised that there was hardly even a mist in the air and the morning looked surprisingly good as the sun rose (if a bit dark due to low clouds). Barely entering Smith & Bybee Lakes Wetlands, a red tailed hawk flew in to give me a quick once-over. The camera was out but I was sadly unprepared for this quick visit; still, I did snag a quick snapshot before he continued on his way. This seemed a good way to start out. Smaller birds such as Bewick’s wren, song sparrow, spotted towhee, and black capped chickadee could be heard among the trees but they stayed tucked out of sight for the most part. Although it was relatively dry under the trees as I made my way towards the viewing blinds in the park, and the wind was only a gentle breeze, the fall leaves were coming down so frequently that the forest sounded like a small storm was brewing. 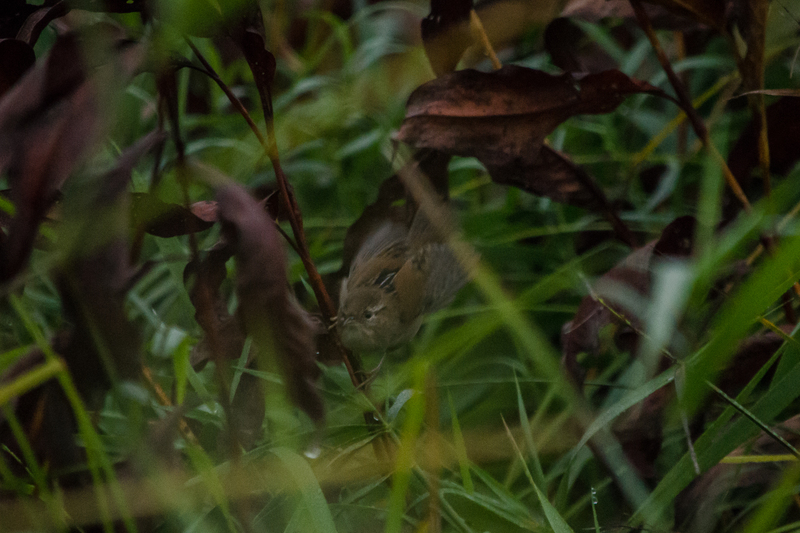 Falling leaves only add to the challenge of bird watching, since it masks the movement of wildlife and makes you look twice as hard to see if that was a flash of feathers or just a brown leaf moving in the brush. 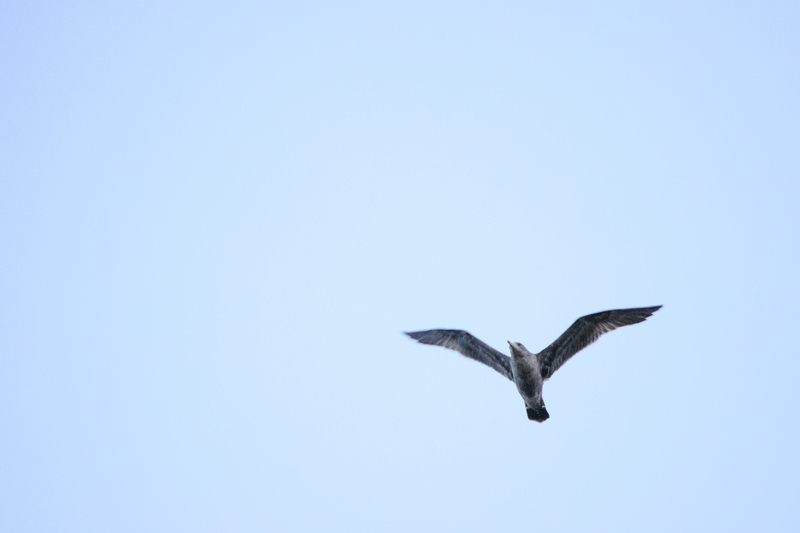 At the Bybee Lake viewing blind, a young gull came by overhead (generally speaking, younger gulls have more mottled patterns and coloring, whereas adults have cleaner looks to them), but for the most part my bird watching was done at a distance here. I am definitely looking forward to the water levels in the wetlands rising, as this time of year the lake’s edge is pretty fair out from the viewing blinds, meaning so are the birds. However, it was still a productive venture as I stood and observed; there were more species intermingling than I had been able to discern on my last trip to the area. Sitting low in the water, the very distinctive sharp triangle shape of the head helped me to identify canvasback ducks (#107 for my list this year!). 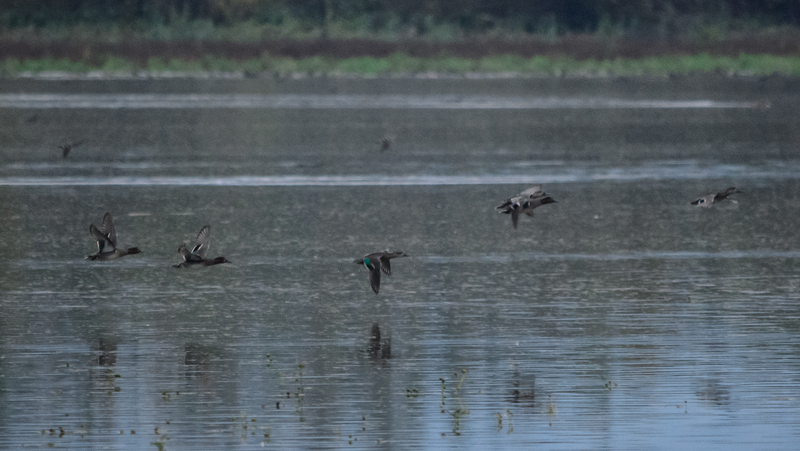 Nearby, the narrow white streak going up the side of the neck on male northern pintail ducks stood out among the flocks. 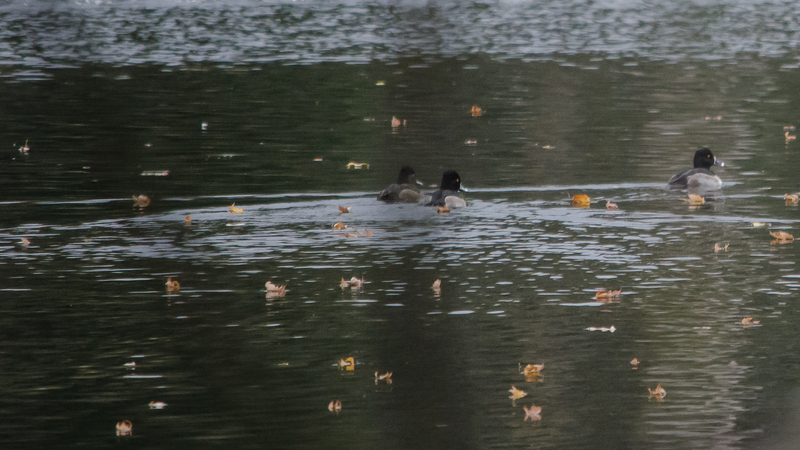 They floated along with some ruddy ducks; both males & females have a dark ‘cap’ of feathers, starting at eye-level and running along to the back of the head. After a time, I headed for the Smith Lake viewing blind; the rains still were holding off, but it was not to last! Half way between the two blinds, the first raindrops made their way through the branches to hit the brim of my hat. Rainy days are another reason to love this particular location, as the trails are paved and allow for a pretty quick pace without a fear of loosing traction in mud. (Slippery wet leaves are another matter, but far easier to avoid.) Unfortunately the view at the second blind was not nearly as active. Weighing my options, I decided to make my way back to the car rather than stay under cover with nothing to watch but the rain. 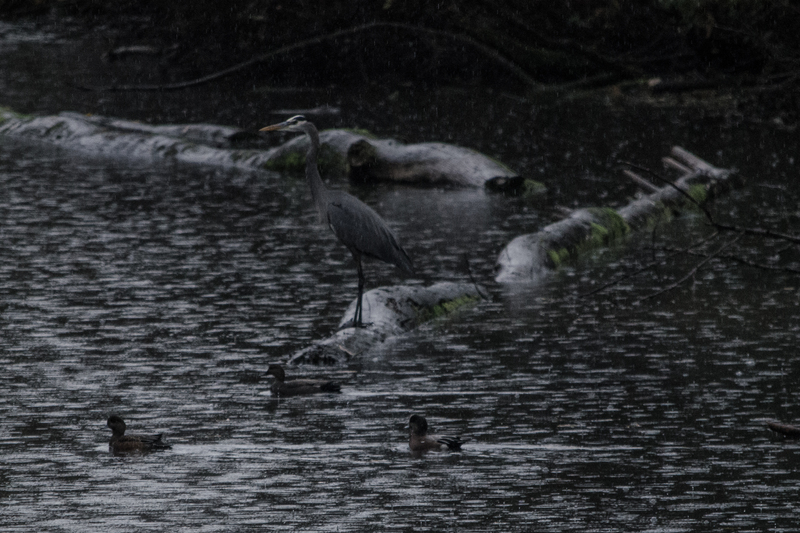 I could not resist stopping at a little lookout point on the trail along a slough, though, and was rewarded with a great blue heron still fishing despite the weather. 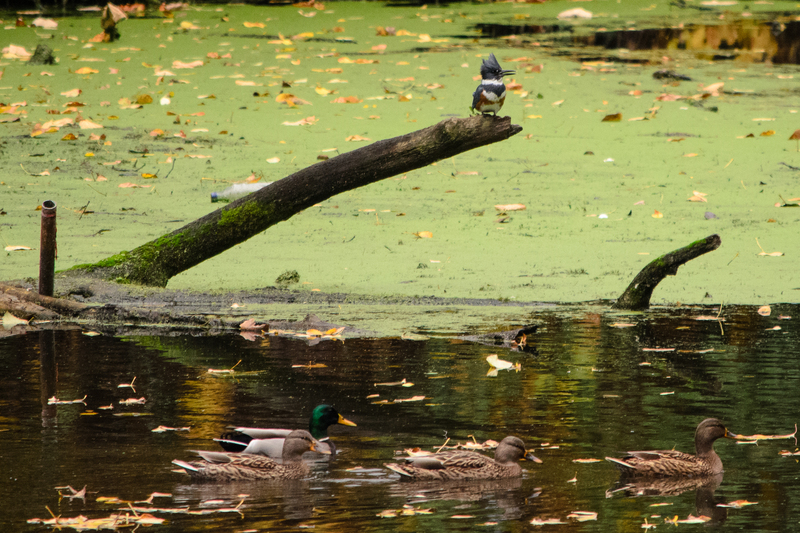 A few American wigeons paddled nearby, and I felt the scene well depicted a typical gray autumn morning here. By the time I reached my car, it had all but stopped raining. (These short but intense showers are also typical in the area.) The clouds appeared lighter. The canoe launch just a little further down can sometimes be a great spot (I owe that tip to another birder on a previous visit); quite a few great egrets and great blue herons were nearby, as well as several green winged teals and a few more pintails. Also seen at Smith & Bybee Lakes were American coots, mallards, Canada geese, common merganser, northern shoveler, pileated woodpecker, double crested cormorant, pied billed grebe, and mourning dove. Feeling like I was pushing my luck, I once again returned to the car. Still, I did not quite want to give up on the day. Searching nearby areas on my iPhone (hurray for technology), I spotted Force Lake on the map; I had never stopped, but knew it was a potential birding site. Opting to check it out, I was very pleased to find that I could park right beside the lake on one of several pullouts; I didn’t even have to leave the dry warmth of my car! 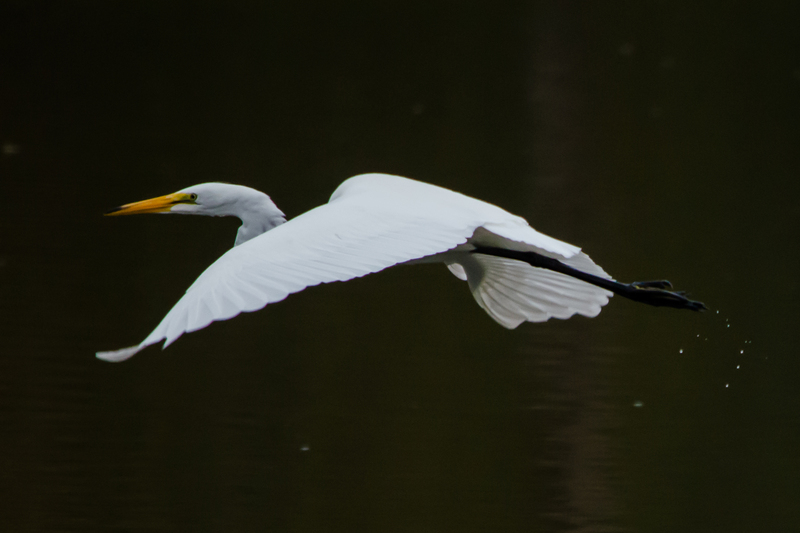 A great egret hunted small fish and frogs very close by and I stayed for quite a while, until he moved on to a new spot further away. He was hardly alone at Force Lake; I was surprised by the amount of activity so close to the road, although there wasn’t much traffic as it’s technically a dead end leading into a golf course. 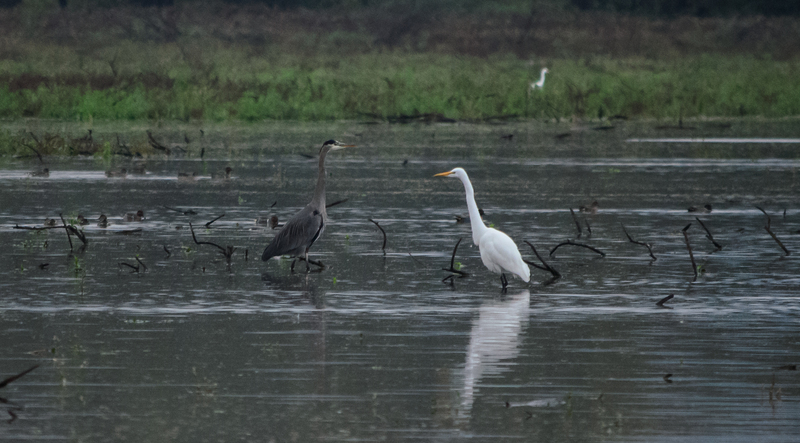 A great blue heron, another great egret, and several double crested cormorants were around. 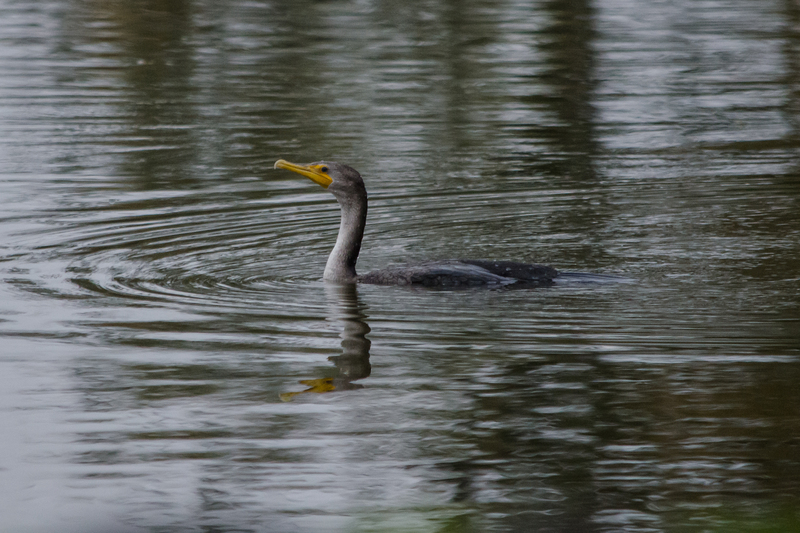 Most of the cormorants were younger birds, as they still had pale and brown feathers; adults are a dull, solid brown-black aside from the patch of orange skin on their face. Adults & juveniles alike have strikingly vivid blue-green eyes. 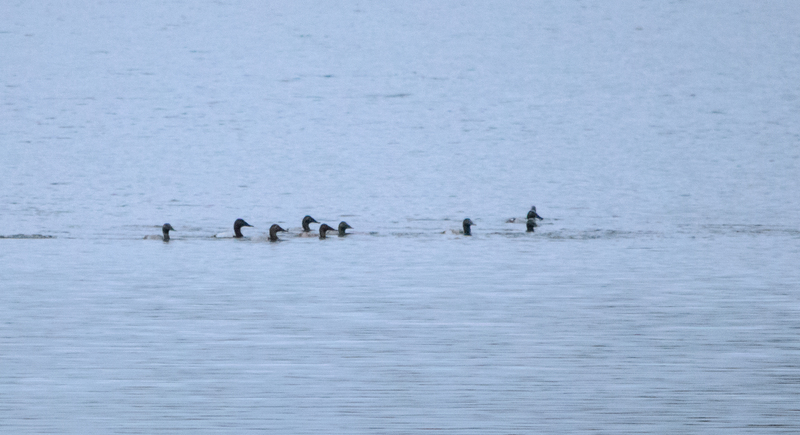 Small groups of water fowl stuck together, including mallards, common merganser, and hooded merganser. 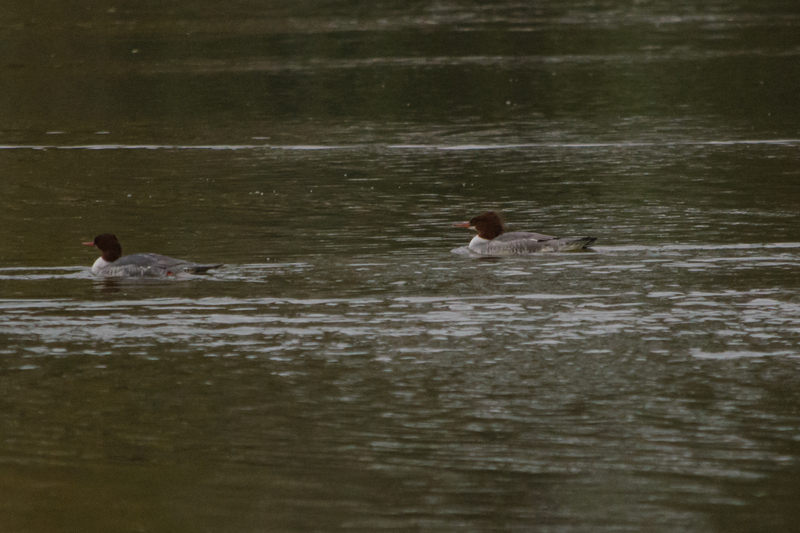 Mergansers have a serrated-looking, narrow bill in comparison to other members of the duck family. Common merganser males are white with a black back & green head; females and juveniles are light grey-brown with a cinnamon head with a mohawk-like crest on the back. 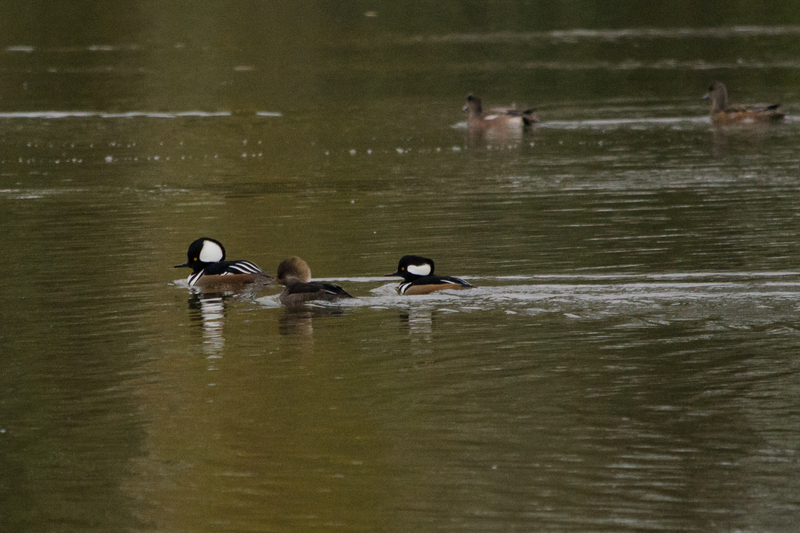 Hooded merganser males have a very distinctive black head with large white spots, and when their crest is raised the head can look disproportionately large; the females are grey-brown and also have a raise-able crest, although in a much less dramatic shade of brown. I decided on just one more stop while the rains held off. It had been a few months since I had visited Whitaker Ponds Nature Park and it was not too far from the area (relatively speaking). It isn’t a very large park, at just under 25 acres and a short half-mile of trail, but it includes two ponds and is right beside a slough, so it gets a good amount of wildlife visiting this otherwise urban location. 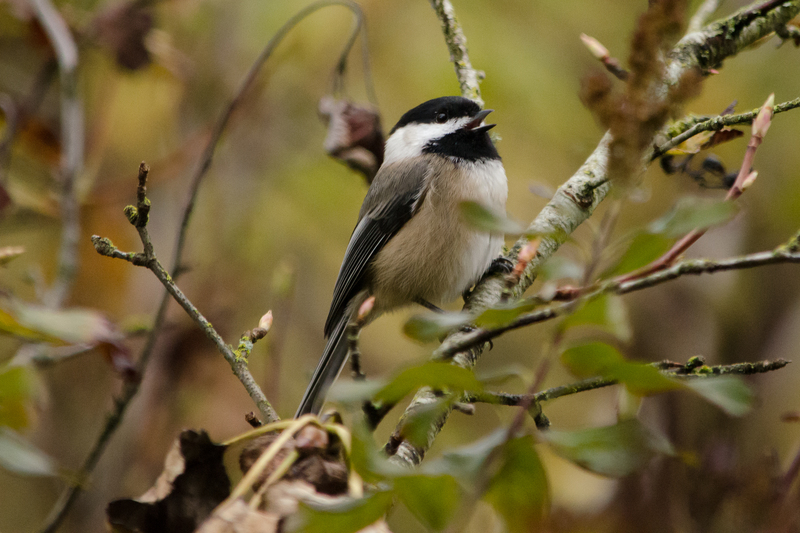 I was greeted by a black-capped chickadee almost immediately, and he was cooperative in having his picture taken. A nearby mourning dove was more camera-shy. Several squirrels were also in the vicinity, stopping to peer at me from their branches. Heading down onto the observation docks, I could see a good number of ducks as well as a great blue heron hanging out. 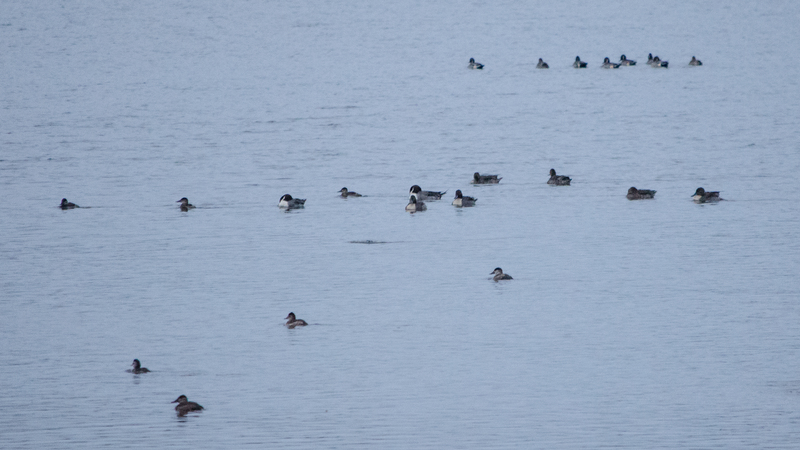 The ducks included mallards, common merganser, hooded merganser, American wigeon, and ring-necked ducks. Wary of my presence, they kept to the far end of the pond while I was there. Going over to the slough, the very-identifiable call of a belted kingfisher caught my ear and I hurried to see if I could spot it. The rusty brown streak on the belly identified her as a female, and she moved back and forth between a trio of perches nearby for a few minutes before moving down along the water way when it once again started to rain. Taking that as my cue, I once more returned to my car and headed for home. Overall, I would call it a very successful series of short stops. To learn more about the placesI visited on this outing, including addresses and websites, check out my Birding Locations page. Be sure to visit my Flickr site for more images from all three locations, as well as some of my other photographs.